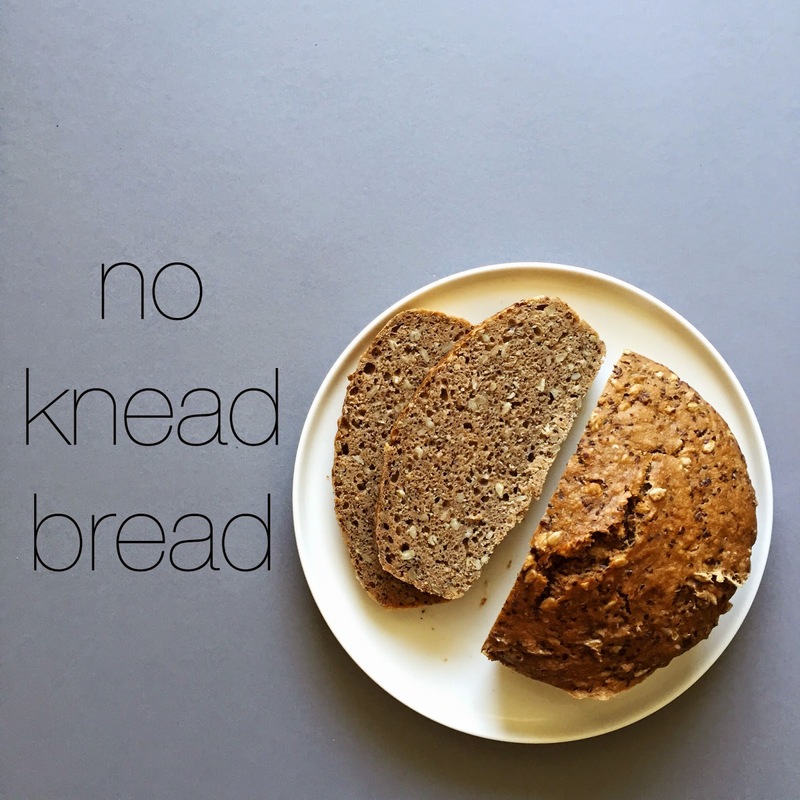 The basic recipe of the no knead bread has been floating around the internet and especially Pinterest for a while now. I actually discovered it in a book about two years ago and baked the first loaf last summer. 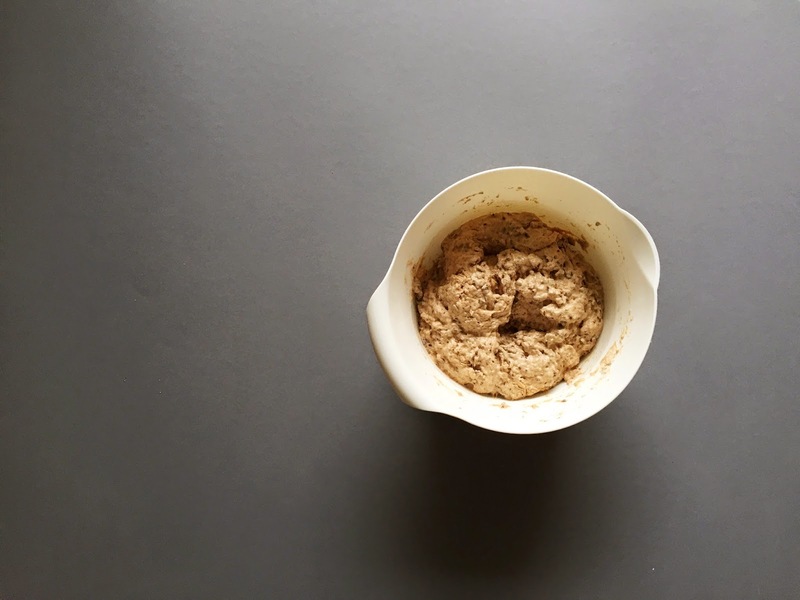 Special about this recipe is that the dough doesn't need kneading, only time. It took me a while to find the mixture of ingrediences that worked for me, though. I started out with a mixture of spelt and whole wheat flour, then tried rye, and now I always only use organic whole wheat flour. And then there are the countless options for other yummy additions... Nuts, seeds, herbs, oils, everything is possible! A word about bread seasoning: when I started with the bread baking I purchased bread seasoning in a local organix food store. Then I looked up the ingrediences and decided I could make my own. I mix anise, fennel seeds, cilantro seeds and cumin in equal parts, keep it in a glass container and throw one teaspoon of it into the bowl when I bake bread. Mix the ingrediences in no particular order except for the water, mix thoroughly with a spatula, and add the water. Fold the mixture until combined, cover the bowl with a dish towel and let it rest for 12 hours (or over night). The basic recipe states that the resting time can fluctuate between 12 and 36 hours. I let it rest for 30 hours once and the dough had started to get mouldy on top. Eeew. I usually mix everything at night and then bake the bread in the morning. Once the dough has rested, I usually fold it again once or twice with the spatula. Grease a pot with butter, add the dough, put a lid on it and bake it at 230°C (446°F) for 30 minutes. After 30 minutes, remove the lid and put it back into the oven for another 20 minutes. And that is it! It may take a while until you find a mixture of ingrediences that works for you but I highly recommend this recipe. It's yummy, there are countless ways to adapt it to your taste and it's super easy to make!